Apple season is one of my favorite times of the year. 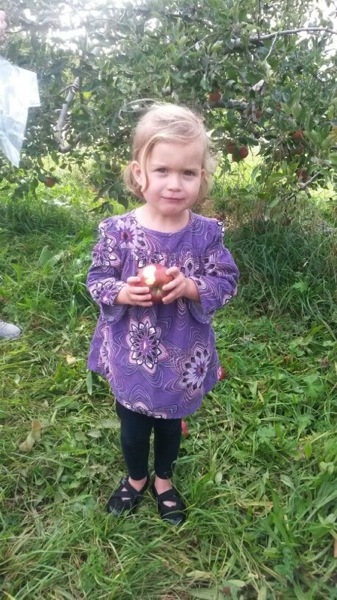 We have been apple picking at least 8 times this year, but that has not stopped me from planning another trip to the orchard next week. It’s a great toddler activity because they can easily do it, run around and get some energy out and enjoy a healthy snack (or 4) while they play. And the activity ends with some of the best and usually cheapest local apples you can find. A win – win – win. This year though, we have not done much with our apples besides eat them. My mom has made a few big (and delicious) batches of apple sauce, but most of our apples are turned into snacks for the car or “treats” before dinner. After our last apple picking trip, we decided to turn them into some real treats. You can see how helpful Kate was. 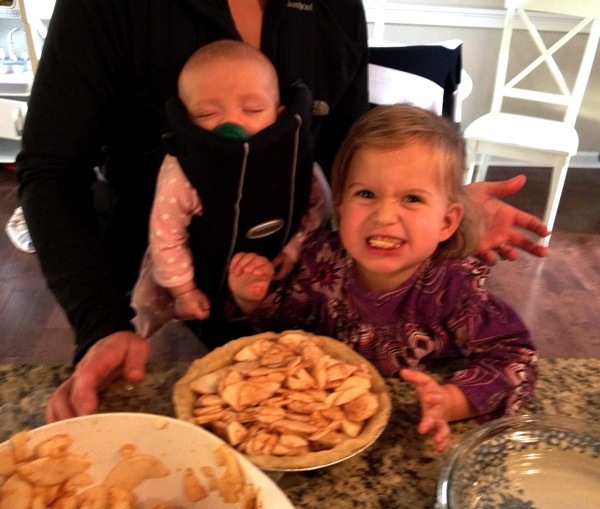 Luckily my mom was over to lead the pie/crisp making charge with the mini-chef. We did a few traditional pies for the freezer and a few apple crisps to change things up. 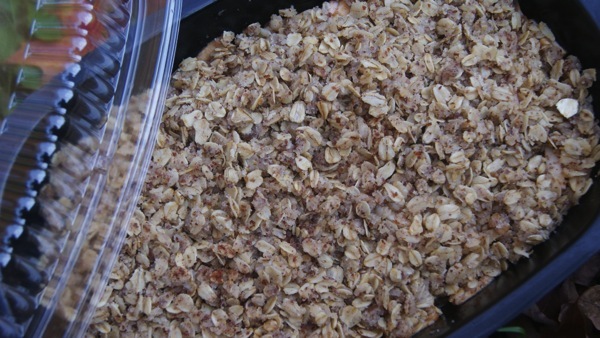 I love making apple crisp because it tastes like pie, without the extra crust! You can save lots of fat/calories by omitting that bottom crust without jeopardizing the flavor. Unless, of course, you are making your Great Grandma’s crust – then go for it! We weren’t tackling that project with my two little helpers. 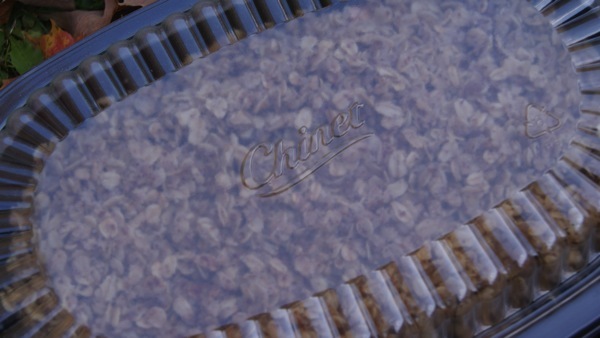 If you are sharing your apple crisp with a friend, use Chinet’s Bakeware. It’s able to be heated in the oven, comes with a clear plastic lid and can be reused or tossed by your friends so no one has to worry about returning dishes! If not, grab a pie dish and spray with cooking spray. In a large bowl, combine the apples, sugar, and cinnamon and set aside. In another bowl, melt butter and coconut oil. 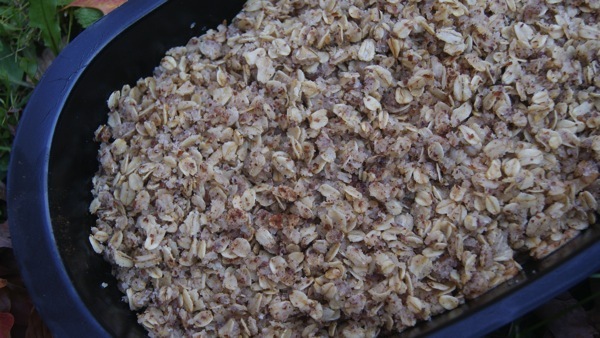 Add oats, almond flour, sugar, and cinnamon and mix until combined and crumbly. Put apples in the bottom of your dish and cover with topping. Bake for 25-30 minutes or until apples are cooked and topping has browned. Leave a comment or “like” The Healthy Hostess on Facebook for a chance to win Chinet Bakeware before the holidays!! Apple crisps are my favorite fall/winter dessert. I love the crispy toppings, with slightly sweetened apple filling, topped with a good quality vanilla ice cream. 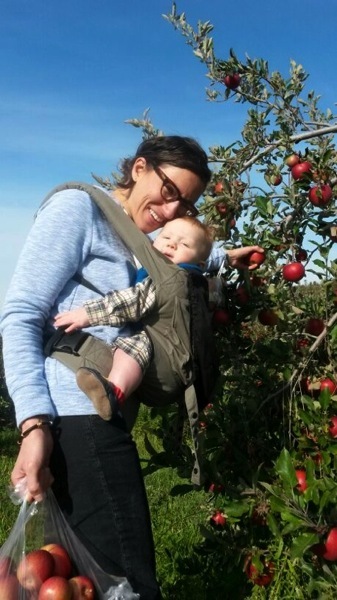 I haven’t made it out to the orchards yet to go apple picking but it’s on my list of things to do! I make most of my pies without crusts – pumpkin pie becomes pumpkin custard, apple pie becomes apple crisp, quiche becomes crustless quiche. It makes my life much easier! I love apple crisp with vanilla ice cream too!! Pumpkin custard is a great idea and I love crustless quiche, as well! I already like you on Facebook. Holiday Baking – my favorite thing I do all year!